This first-class hearing aid offers everything in Audéo™ M plus the added convenience of built-in rechargeable Lithium-ion batteries. The Marvel processing platform still includes fully automatic hearing, including new programs for soft speech and music. 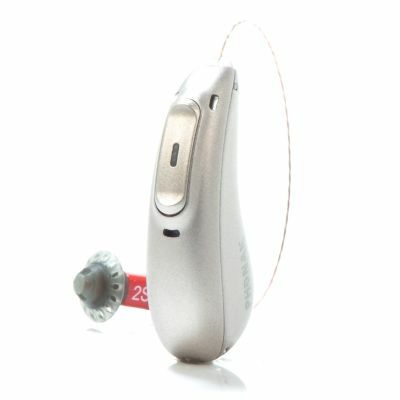 Like the non-rechargeable version, these hearing aids feature automatic sound classification of speech and music, even for direct-streaming audio (an industry first). The Marvel platform introduces power-saving technology, so you can enjoy a full day of hearing including streaming without having to worry about changing batteries. Charging options include a Mini Charger Case with USB-C charging, or Phonak Charger Combi with optional reserve battery. You want a true hands-free phone solution for direct streaming from Android and Apple iOS mobile devices, or older Bluetooth-enabled phones - and you want rechargeable batteries. You’ve been stalling until reliable, battery-friendly, high-quality wireless streaming came around. It’s here!